The Roof Coating Company is a full-service commercial roofing company providing long-lasting roofing solutions to clients in Hampton, VA. Our team has over 60 years of combined experience. When you’re in need of a qualified commercial roofing contractor, give us a call at (757) 244-2305. We’ll come by onsite to evaluate your roof and give you a free estimate! The Roof Coating Company offers a range of services, from general repairs to roof replacements. Our professionally-trained roofing technicians are completely licensed and insured which means you’re fully protected when we’re on the job site. 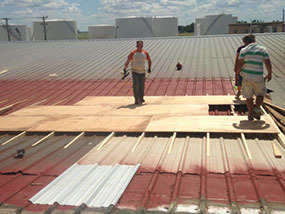 The Roof Coating Company works on all types of commercial roofs, including single-ply roofing, metal roofs, and more. We specialize in roof restoration. By restoring your roof, you’ll extend the lifespan of your existing roof which helps you save both time and money. A roof coating is a thin membrane that covers your existing roof and keeps it completely watertight. This seamless membrane is easy to apply and affordable. Plus, it reflects the majority of the sun’s rays which helps to make your building more energy-efficient. 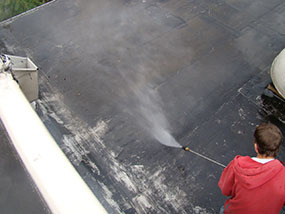 The Roof Coating Company offers thorough roof inspections. When you call us to take a look at your roof, we’ll find any leaks or other issues. From there, we’ll be able to provide the solution to your roof’s issues, whether that mean repairing, restoring, or replacing it. The Roof Coating Company teams with a number of the top organizations in the industry, including ENERGY STAR. We use only the top roofing products and we only employee the best roofers. Our team looks forward to forming more longterm business relationships with clients across Virginia. Customer service is extremely important in the commercial roofing business. The Roof Coating Company is known for providing top customer care and keeping clients in the loop at all times. We’re a punctual and trustworthy company that has earned a solid reputation in Virginia. When it’s time to hire a proven commercial roofing contractor, call The Roof Coating Company at (757) 244-2305. We offer free onsite roof evaluations and all types of commercial roofing services to clients in Hampton, VA.